¶ 2 Leave a comment on paragraph 2 0 Speaking to the Society of American Philatelists that same year, Eilenberger assured collectors that the Roosevelt administration would only honor subjects of “national importance” on limited-issue stamps. The criteria also included FDR’s newest relief program. Designed and issued soon after the establishment of the National Recovery Administration (NRA) in 1933, the National Emergency Relief stamp worked to influence participation in and support of FDR’s earliest New Deal initiatives. 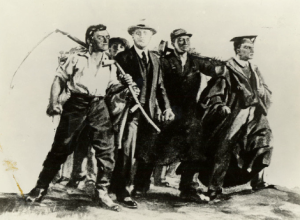 FDR established the NRA with an executive order to promote industrial planning in establishing codes to regulate labor, prices, and production. To make the NRA stamp fit logically with the spirit of the existing commemorative stamp program, Eilenberger created a narrative of American progress that wove together the stories behind two other commemorative stamps issued by Hoover’s administration in 1933. 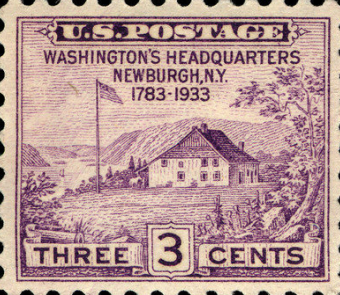 ¶ 6 Leave a comment on paragraph 6 0 Similarly, in the Century of Progress stamp that promoted the 1933 World’s Fair in Chicago, Eilenberger saw the “fulfillment of sacrifices and struggles of the early pioneers,” such as the sons of Washington’s soldiers from Newburgh who migrated west and south “in search of better home and greater opportunities for their children.” Their “success” was aided with developments of science and technology, but it really was due to “self-reliance” and the “American spirit.”3 The NRA stamp, representing a voluntary collective effort to manage labor, wages, and pricing in a time of economic depression, was crafted as the logical next step in the progressive and triumphalist vision of American history that prized individualism and encouraged individuals to work together for a greater good. 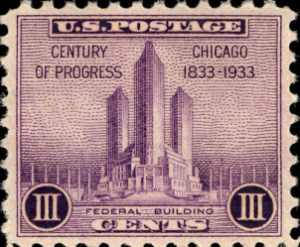 As support for the NRA’s voluntary codes and wage equality waned in 1934, Eilenberger gave a political speech to philatelists using the language of stamp imagery to seek support for the New Deal program. ¶ 9 Leave a comment on paragraph 9 0 The stamp’s first design incorporated the NRA’s blue eagle, but people won out over the symbol. 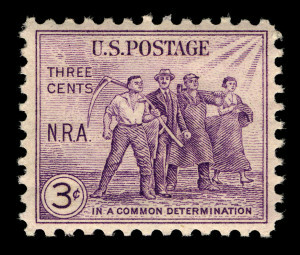 The faces united “in common determination” on this stamp were racially white, representing different ethnic backgrounds of American workers. The absence of an African American in the crowd accurately reflects that most black workers did not benefit from the NRA programs. Many lost their jobs because white employers refused to grant African Americans the same pay and benefits as their white workers, or employers ignored the industry codes to retain their discriminatory pay practices.5 On the other hand, a white woman stands as an independent person walking equally next to the industrial worker, farmer, and business man. Three of the four are looking ahead in the same direction with a “common determination.” This image also represents nameless citizens who are not soldiers or fighting in the name of independence. Instead, they are going to work together with a shared purpose, on equal ground. ¶ 10 Leave a comment on paragraph 10 0 In the stamp, the business man stands slightly apart from the others as he looks directly out of the stamp to its viewers. Collectors noticed this difference and wrote to both the Postmaster General and to President Roosevelt asking why the individual representing “Business or Capital is out of step” with the others when the stamp should represent the nation moving forward together. 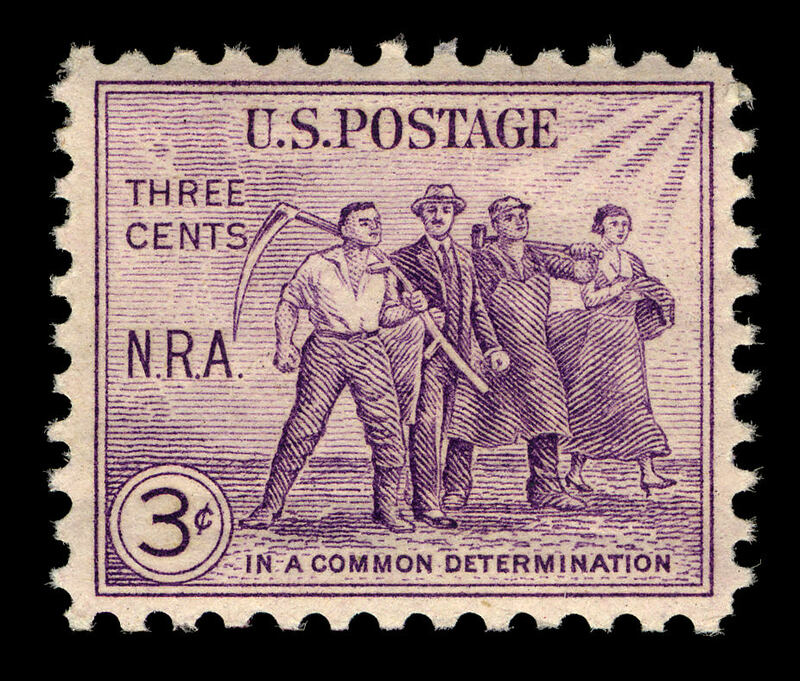 Department responses to collectors noted that the image came from an NRA poster indicating that in fact the business man is “a pivotal figure of the group, rather than being out of step.”6 An alternative stamp design actually drew FDR into the illustration among the workers. As a living person, he could not appear on a stamp, but we then can see that the business man in the printed stamp who is pivotal in the recovery efforts is Roosevelt. The rejected design also represents academia with a male graduate dressed in cap and gown, and a woman looks over the shoulders of the farmer and Roosevelt, relegated to the background of the image and not standing equally among the men. The final NRA stamp represented citizens as active in their own recovery. ¶ 12 Leave a comment on paragraph 12 0 By the mid-1930s, the Department connected directly with philatelists in ways that it had not in the many years prior, while it also dramatically expanded the commemorative stamp program to attract new collectors. The President and USPOD together worked to foster positive relationships between collectors and the Department to support the hobby, and to bolster optimism about the future of the US by showcasing specific initiatives, including Admiral Byrd’s trip to Antarctica.